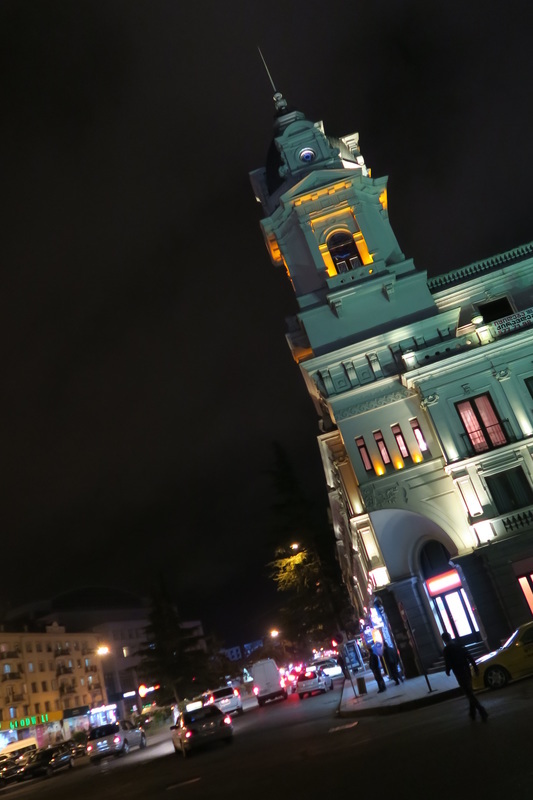 For me in a few words, Batumi was an exciting, enticing city. My room at the Globus was great. The young girl at the reception translated a lot of phrases for me and gave me a heater with which to dry some clothes I had washed. It had begun to rain as I had arrived. It was so nice to be indoors and warm. 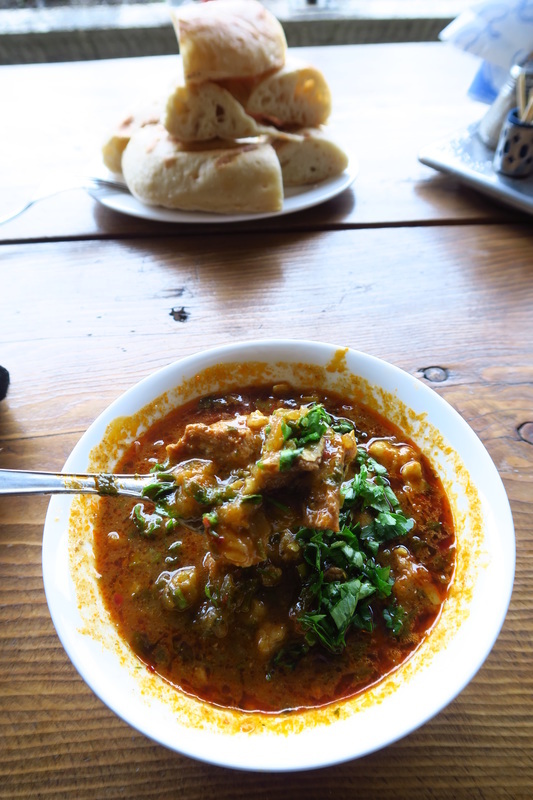 Arriving in town, I had eaten at the Karabak restaurant which I highly recommend. It is a large establishment with a good menu and great eating environment. Whilst in town it was raining so it felt even better being indoors. The architecture in the city was like I have not seen before, having come from many culture over the ages. The use of gold was most intriguing. Real or not, it added a real vibrancy to the cityscape. 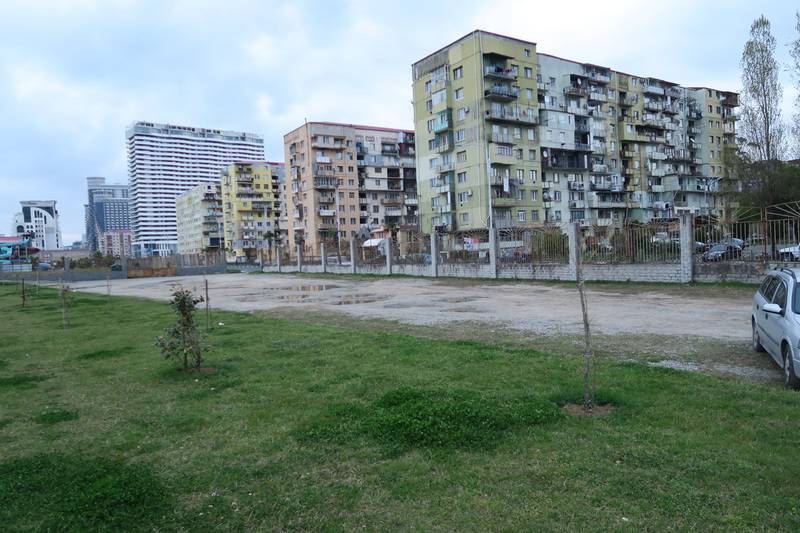 There was a mix of old soviet area apartments alongside brand new complexes. The guy at the tourist bureau was great we spoke at length. 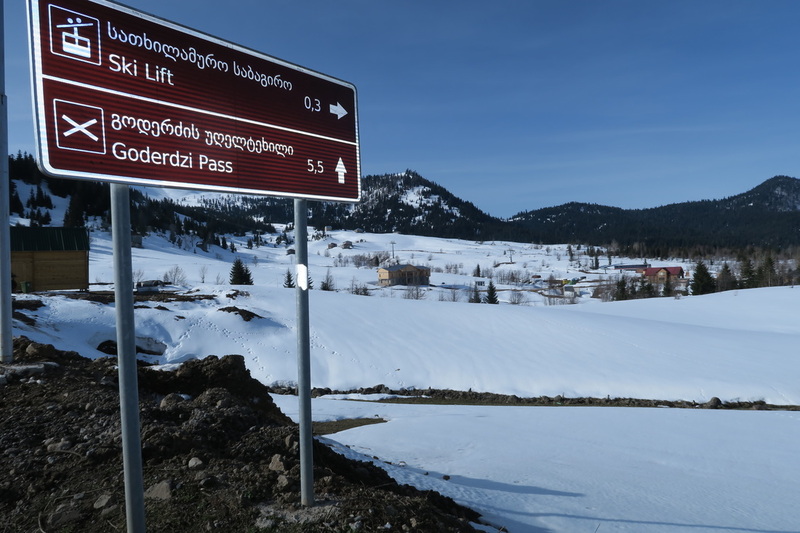 He said the Goderzi Pass was closed. I asked for the number to the Kulho office. 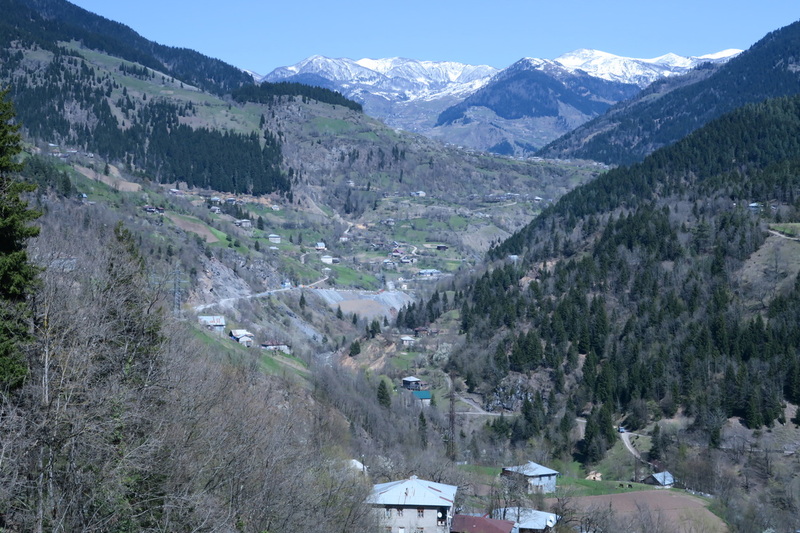 Amazingly and very timely it had just been opend .Great I was going to be able to take this scenic road through to Adegeni and onto Tbilisi. An evening ride in the gondola was taken to up over the city. The views up here were spectacular. I enjoyed 2 beers up here taking in the views. There continues to be problems with my rear tyre getting punctures. I have since found out there is a crimp in the rim tape and this is causing the problem. 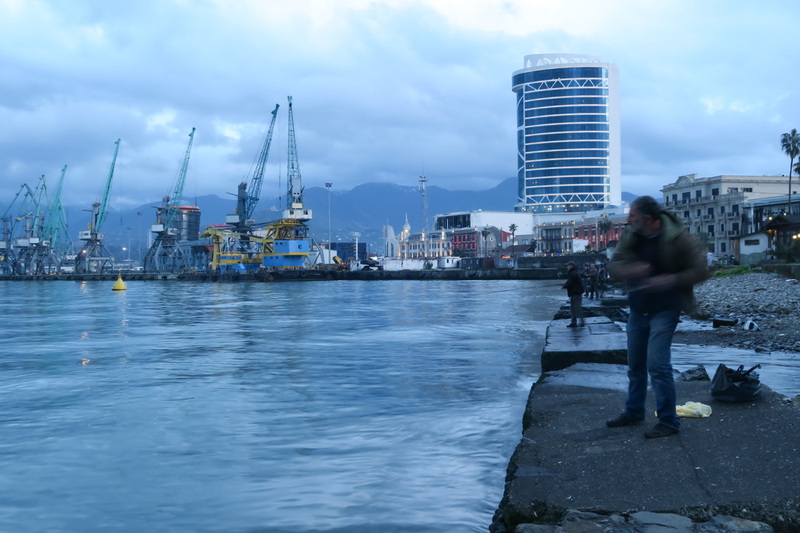 There were people on the waterfront jigging for mullet, with little success that I saw. They were enjoying it though,as you do. Food and other supermarket items are cheaper here. There is o proliferation of early 2000’s Mercedes Benzs here. Many used as taxis. They are imported from Germany and sold here. Much like the situation of second hand Japanese cars in NZ. Kita a guy from Tbilisi was met at the hostal he welcomed me to stay at his place in Tbilisi. However, I will try to use Warmshowers. More money was obtained from one of the dozens of ATM’s in the town. I am always a bit nervous about using my debit card as it has some permanent bends in it. In South Africa an ATM did not return it. What a hassle to get it back. I try to use ATM,s at banks. 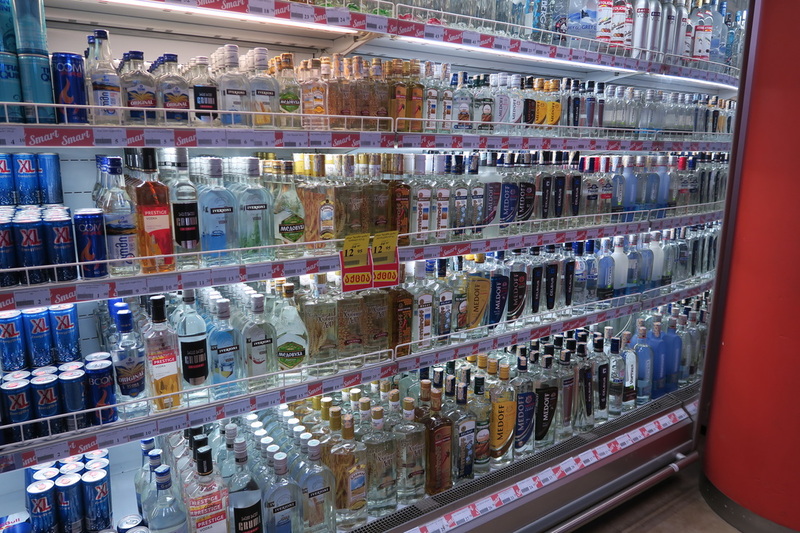 People here love to have a drink and it is for sale in every corner shop. 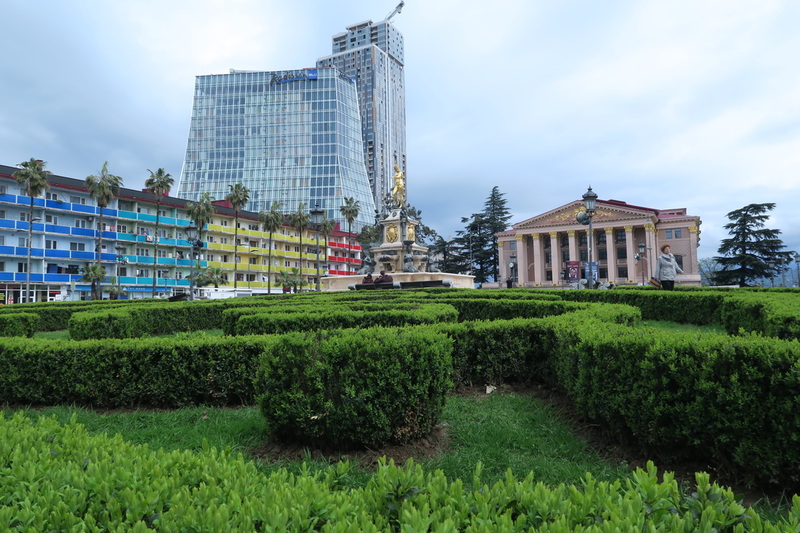 In Batumi there are also many casinos. 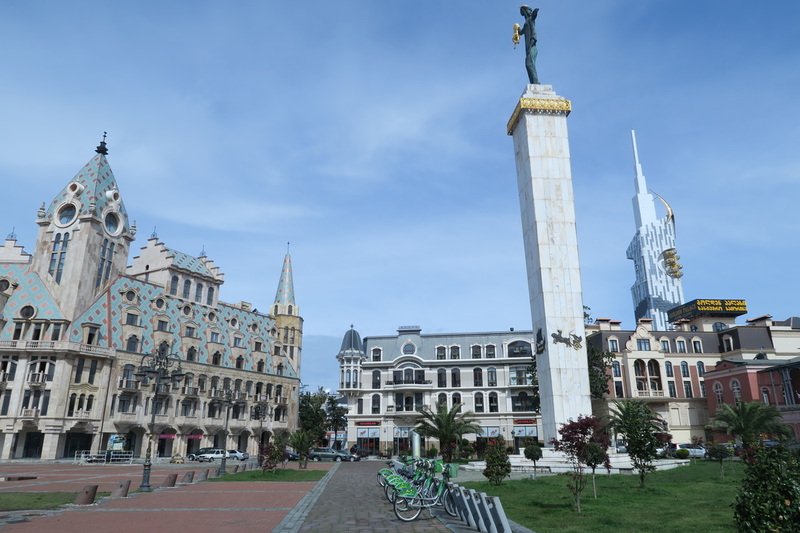 The new government of Giorgi Margvelashvili has continued to promote Batumi as Las Vegas of the Black Sea. Many Turks come here to gamble. Georgia has few natural resources, what a good idea I feel. 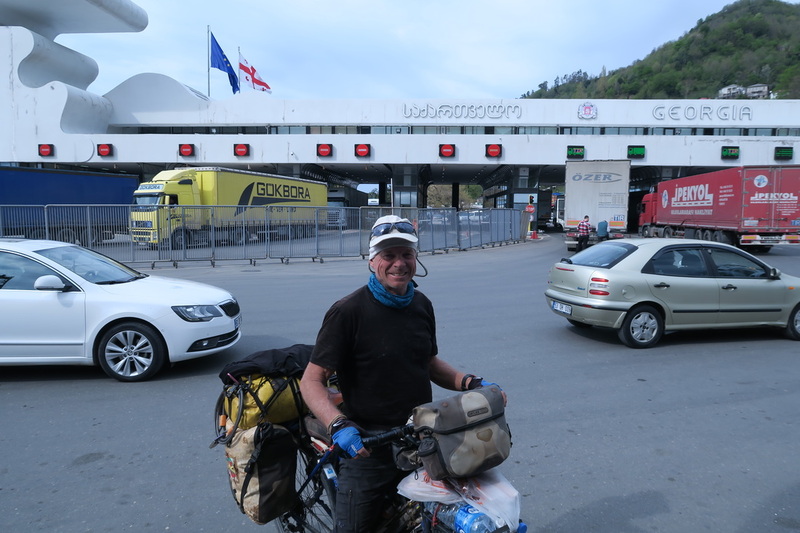 My tax papers were posted to claim the duty free on goods bought in Turkey for the bike. The weather had improved and there was a good window for crossing the mountains. I was a bit slow getting away, a look around for some more suitable reading glasses was undertaken with no success. Another huge meal was had at the Karabak restaurant. It was all ascent from here. Sure enough another slow leak was sustained leaving the city. A stop was made at a tyre rpair place so at least it would not have to be manually pumped up . The guys also ground off some bolt ends on the rear mudflap I had fashioned from an old silicon tube. I caught my pants on this the other day and ripped the knee out of them. The road slowly wound up the valley following a river. It was so nice to be away from a busy road. 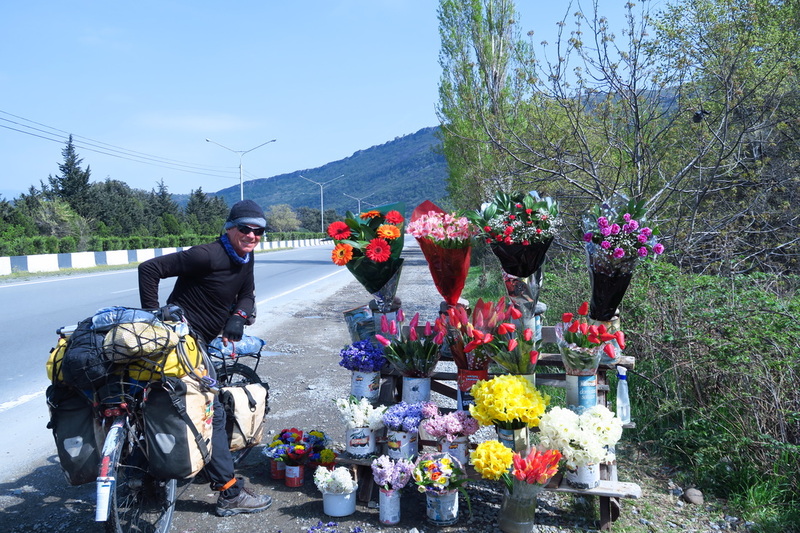 They last week in Turkey was on the Black Sea Highway. The noise of traffic is what wears you down on these busy roads. They are amazingly noisy plces on a bicycle. There were great camping spots everywhere. Most villages had a basically stocked little store, with little fresh products. Lots of processed stuff. Along the way were some of the famous Georgian historic stone bridges. They were fascinating examples of engineering that had lasted the test of time. Other sites were off the road up hills, these were not visited . 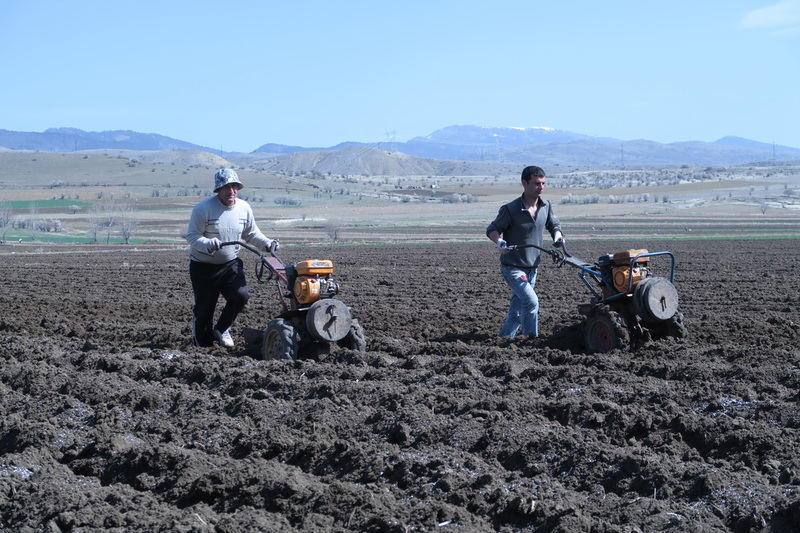 People were busy tilling fields for the coming crops. The roadside was lined with wild Blackberry in most places. The river was a dirty colour, from snow melt and possibly from pollution. There were small villages all the way up this road. People were friendly, most were greeted with the word gar-mahr-joh-baht (phonetic). People responded positively. One lady gave me some water from her house. As the climb took me higher up the valley, it was not to difficult. 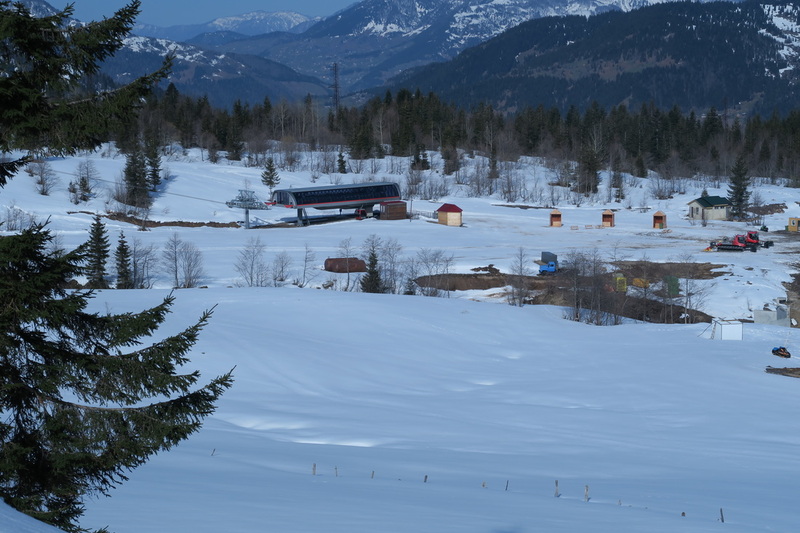 A large construction camp was passed. 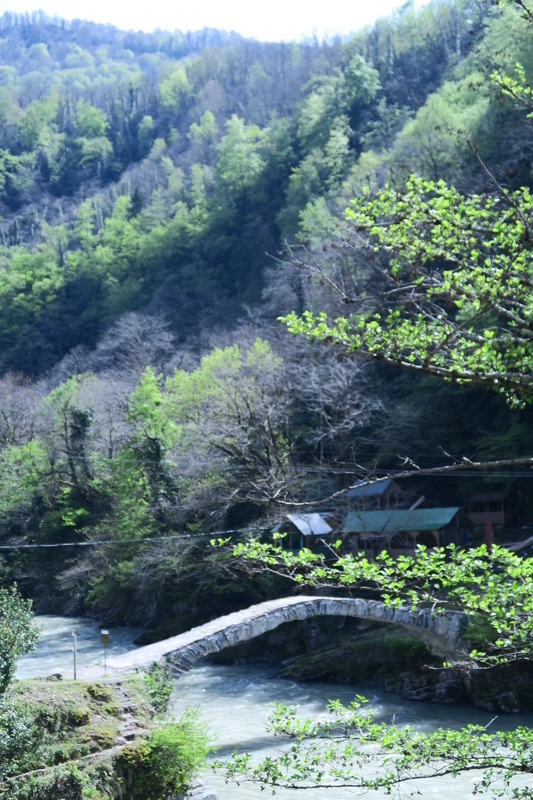 Further up from here the road deteriorated as it wound along the steep sided river valley. It was the Ajuria River. 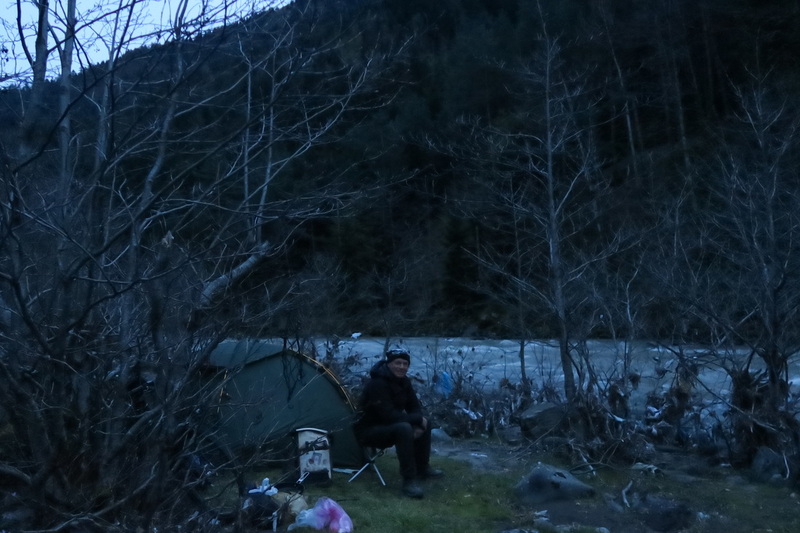 As I climbed the camp sites got less as there was no access down to the river. Finally about 1900hr a track was found down to the river. Here I could only just be seen. It is now not getting dark until 2000hrs which is great as by the time dinner is cooked it is about 2200 hrs a good time to get into the tent. With not to much sleep ahead . Another flat tyre was repaired. This time it was a piece of fine wire from a steel belted radial. It was so pleasant camping beside the sound of flowing. There is something about camping beside the sounds of waves or flowing water. Both mke for a fantastic sleep. The only downside is approaching people or animals cannot be heard . I awoke to a brilliant day in the making. It was surprisingly mild. My rear tyre was still up, this was great. The bike was pushed up the steep track and back onto the road. As the road climbed the scenery became more spectacular. It was Georgia as my mind had pictured it. Conifers and deciduous treeson the steep hills with some pastures and houses scattered among the steep slopes above the river valley. At one corner, I stopped to dry my tent. A guy in ahilux pulled up. 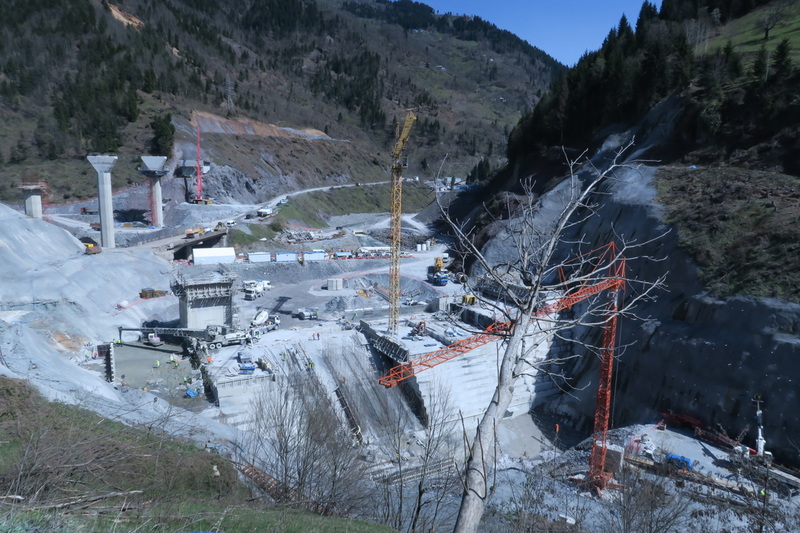 Tom was an engineer and worked for the Nowegian consortium that was building this huge dam project up the valley. They had 17km of tunnels and were using water from two catchments. He said the road was closed. I told him about the guy in Kulho and how he said it was just opened. He kindly phoned friends he knew at the ski field. They later said it was also opened. Tom said he had turned other cyclists away earlier in the year. I was to be the first rider through for 2016. Once the tent was dry, the road just kept climbing, not steep but steady. I lost a cycling glove somewhere. A trip down a few km was made to see if it could be found. It was not! The last part of the climb into Kulho was very steep in sections. 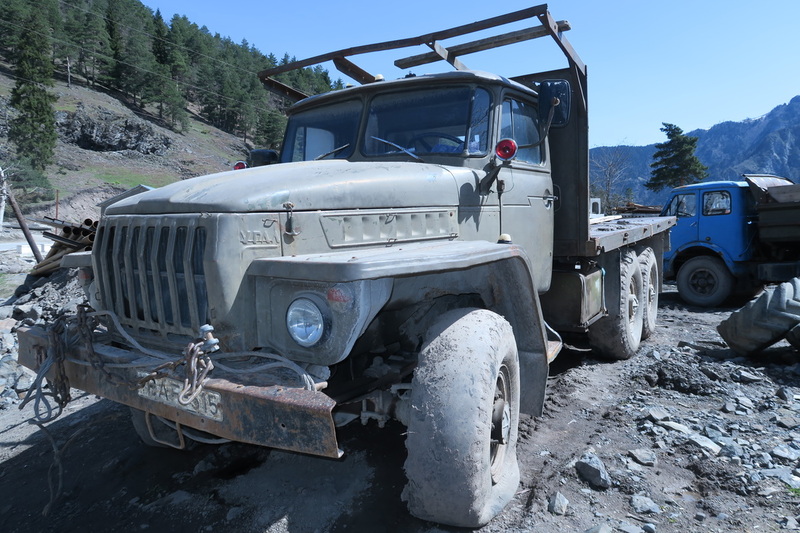 Many of the old Russian six wheel drive trucks were seen. Some in working order, others not . Once in Kulho. I ate in a little cafe at the bottom part of town, two plates of Ostri were enjoyed. The man scratched his throat and motioned did I want a drink. I thought he meant water. Anyway I took a huge gulp of what was in the water glass, it was vodka!! Not exactly what was needed at this time of day. I went over to the Information office and David the guy there who spoke good English told me the road would be open this afternoon. I was wrapped. I rode up to the higher part of the village and bought some woollen gloves and cut the fingers off the ends of these . This would replace the dedicated pair I had lost. They work just as well. Cut off gloves were used through Africa for much of the time. Some veges were bought for camping. The village was on a high knob. Leaving town a great view across to the mountains in the distance could be seen. So it was down into the valley then the climbing began. The road was now gravel. Small rural villages were passed evey few km. The sun was out though when stopped it did not take long to cool down. In one village a drunk guy tried to drag me into the bar. I told the others could they sort this person out, he soon left me alone. No one up here could speak any English but they understood. At one point, the road deteriorated to the point of needing to walk. Here, coming down were three transit vans loaded inside and out with hay bales. I stood to the side of the road in the mud to let them pass. Luckily, some Snickers bars had been bought, these sustained me through the afternoon. 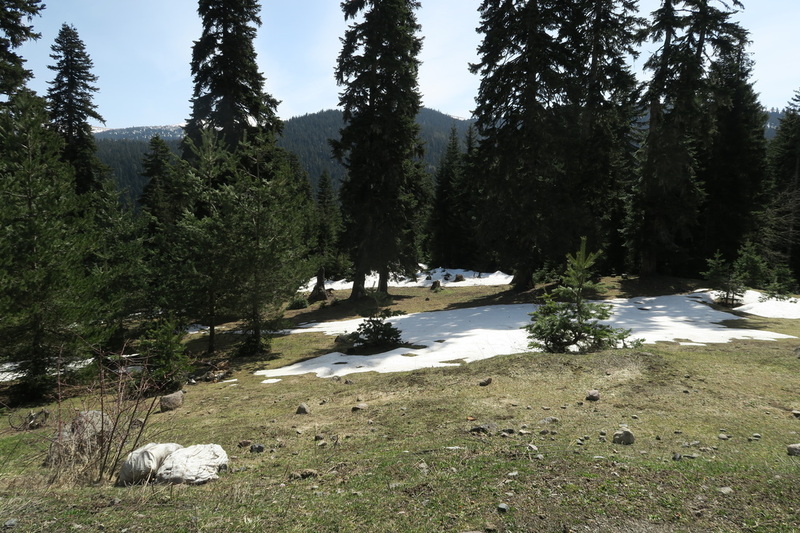 I soon got to the snowline, here it cooled off even more. 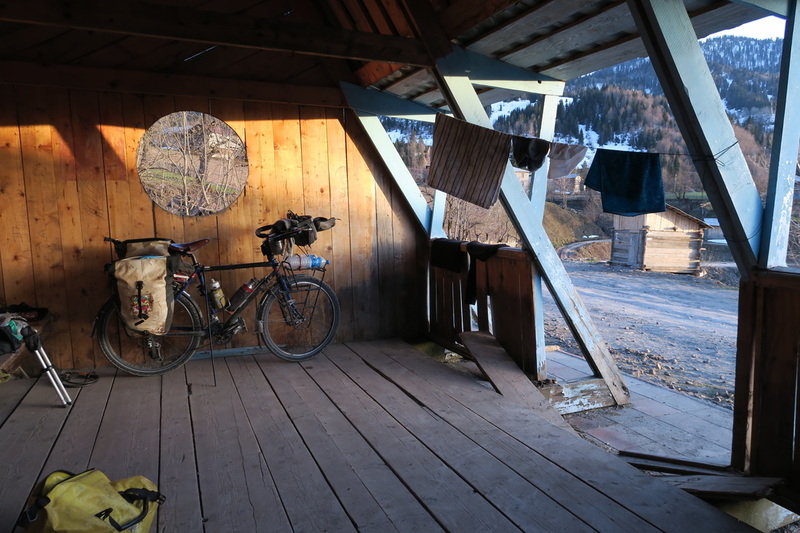 In a village there was this large wooden floored roofed bus shelter. There was no point going any further. I was totally worn out and struggling with my balanace when stopped. This was a great place to camp with lovely views. There were few locals about. Some mini buses passed but few paid any attention to me. There was a fountain and a toiled right here so all was good . My tent as pitched inside and a great pasta prepared. I rave about these and find myself looking forward to eating them when they are prepared. Fantastic day, mild 7 degrees in the morning. I was up very early, knowing that, I needed to get over the pass in the heat of the day. The road further deteriorated but was still rideable. It was not long before there were no occupied dwellings as altitude increased. I could feel my breathing becoming more rapid as I got higher. The cold was not an issue as the sun was up and the exercise required generated plenty of warmth. Arriving at the Goderdzi Pass ski field I spoke to one of the staff there. He said nothing about the road, so it was open. 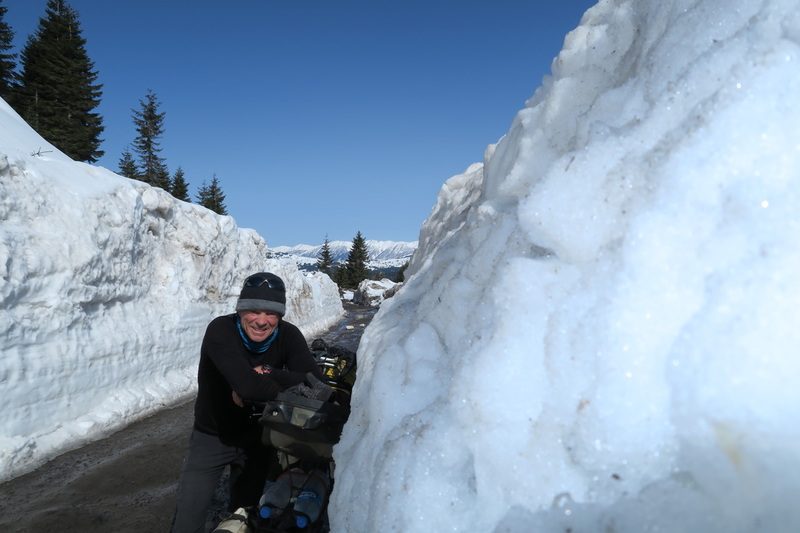 From here the road was piled high with snow on both sides and the sun was unable to penetrate its surface. The road was icy. From here I pused the bike for 5km to the top of the pass. I was pumped with adrenalin, it was easy. At the summit. I briefly stopped to tack a quick video and kept going. By now a few cars were coming and going. All were four wheel drive . Heading down the sunny side the thaw was well under way with water running down both sides of the road and in the wheel tracks. 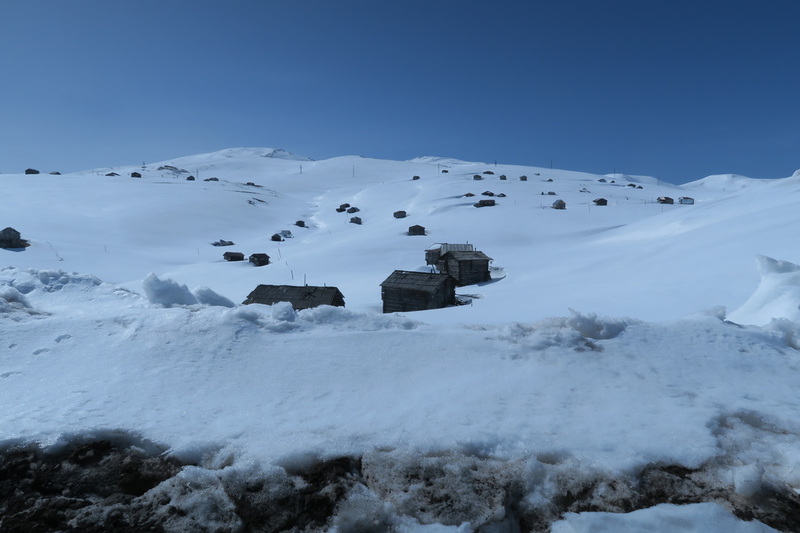 The scenery was now of gentle snow covered slopes with small huts everywhere for housing animals they bring up here to graze in the summer months. My brakes were getting a hard time coming down with all the grit and dirt in the water and on the rough road . 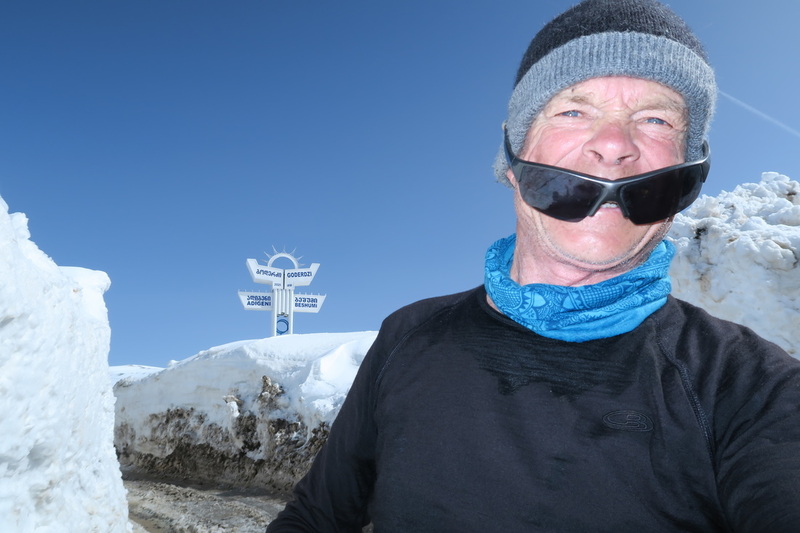 I was on a high having made it to the summit .It did not take long to get down out of the snow and back into conifer covered slopes. 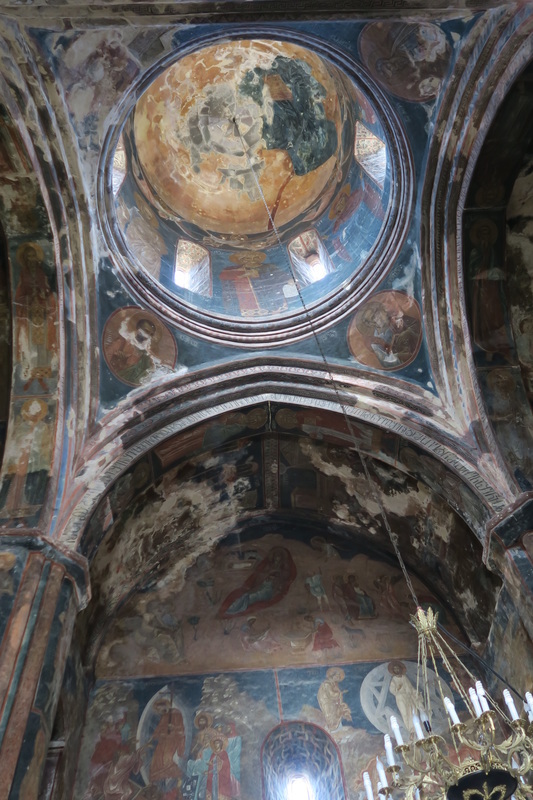 Before getting to Adigeni, I stopped at a Georgian orthodox church. 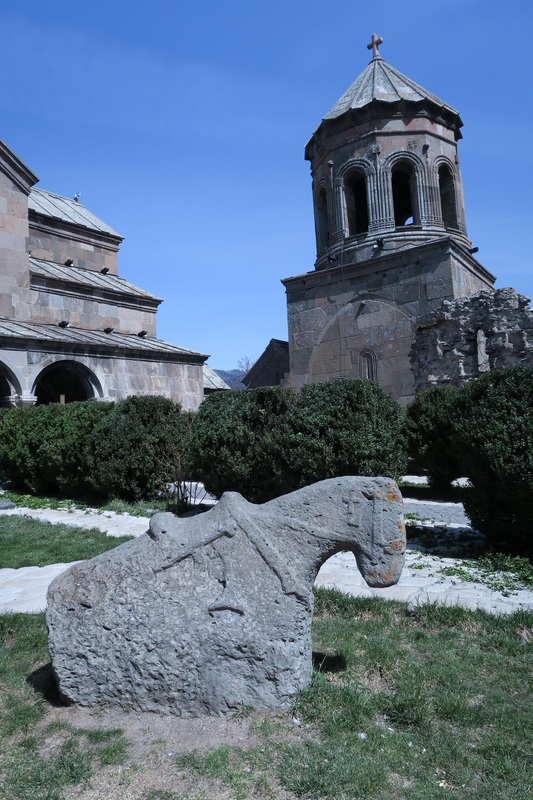 It was built during the 14th century. Rolling back down to the main road my rear wheel was making a grinding noise and there was a squeak in my front racks. Coming down the hill I had met two doctors without borders they told me to go to Abastumani and stay in the resort there and have a hot swim in the sulphur pool. Before the turnoff in the now hot temperatures. I stopped at a gas station and inspected the bike properly. 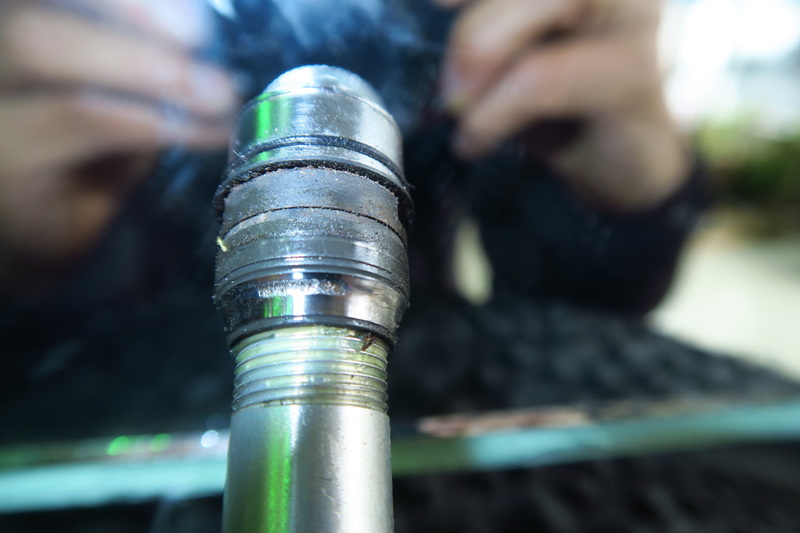 One of the braze ons on the fronts forks had broken free, that was the squeaking noise. The rear hub continued to make a terrible noise. 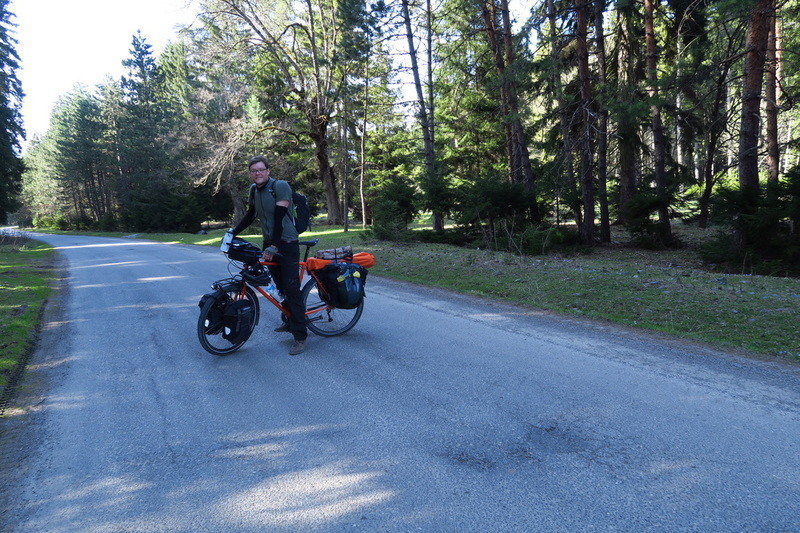 I rode the ten kilometres up the valley to the resort. Once there the need to fix another slow leak was addressed. I got my gear in the room and put swimmers on and lunged into the divine waters of the indoor pool. 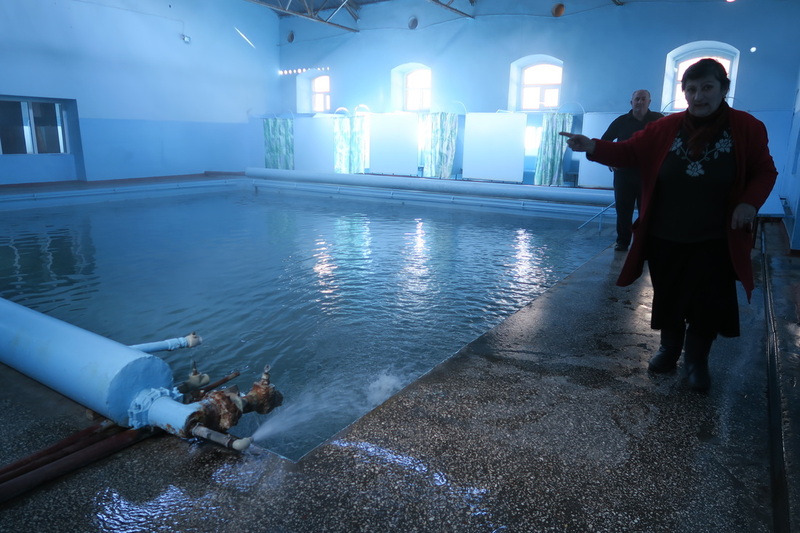 It was like a big bath. After such a huge day this was other wordly and so relaxing . I went down to the local market and bought smoked mackerel from the Ukraine. This and a cold beer were enjoyed for dinner. 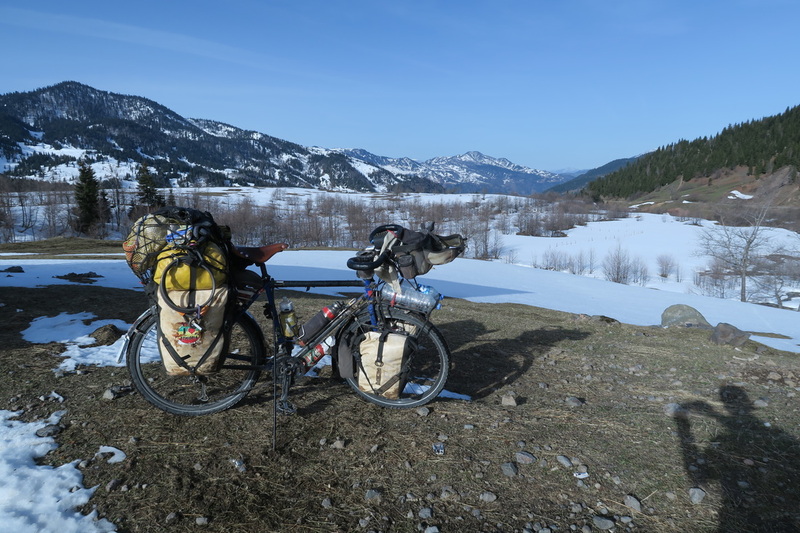 Not in any big hurry to leave, I was on the road at 0900, it was an easy ride back down the valley .Back on the main road there were large areas of flat arable land on both sides. Here people were planting potatoes. I stopped with one group and watched them working whilst sharing coffee with them . They were a happy bunch of people all working together in the large paddock. The women were especially funny. One of the older guys told me to come and sit on a fertilizer bag next to him. I sat on the bag next to him. He had puffed it up. There was actually nothing in it and I fell to the ground. We all had a good laugh . 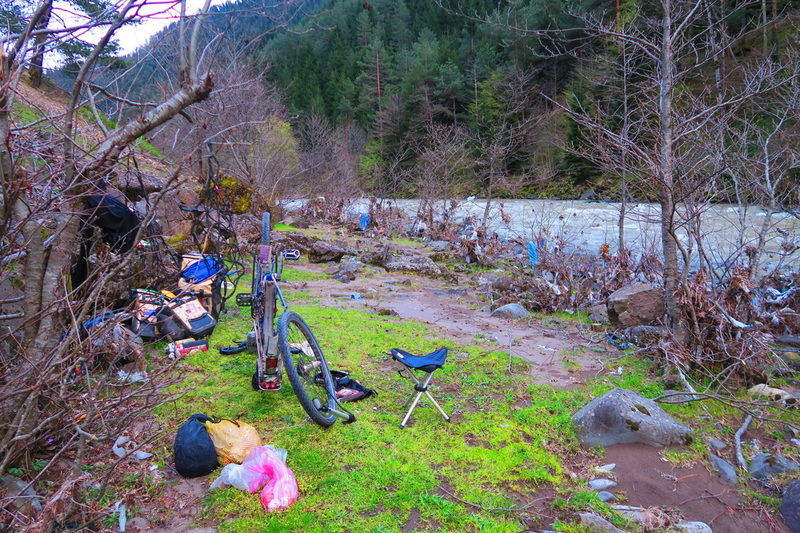 From here I rode on into Athatsikhe and had a great ostri dish and then went onto get my broken braze on gas welded. It is important that these are gas welded. The guy knew what he was doing which made me feel good. He did a great job. It was on the same side as the one that failed in Namibia. Once this was done I meandered off. I was following the river Kura river. The road was now getting quite busy. There was no room to camp on the road side of the river. Anyway about 1800 hrs a foot bridge across the river was seen. This was taken and some 600m up the river from here was a great camp site. Good enough even to play some music without fear of being heard. A great pasta was cooked .The camp was near a deeper section of the river so all was quiet except for some vehicles on the far bank. It had been a great camp, and slightly sloped so my head was elevated making for a great sleep. Again it was easy riding out on the road. Getting to Bojormi, a place to eat could not be found. I was still in a laid back state after all the hard work of the mountain climb. Stopping at the local well stocked supermarket I bought all sorts of goodies for a picnic lunch. Hams and cheeses with gherkins and other things. Leaving town and some 15km on, there was another cyclist on the opposite side of the road. Alex was from Germany but was born in Kyrgyzstan, he could speak fluent Russian and spoke perfect English. We immediately got on well and decided to have lunch together. I needed to get my tent dry. 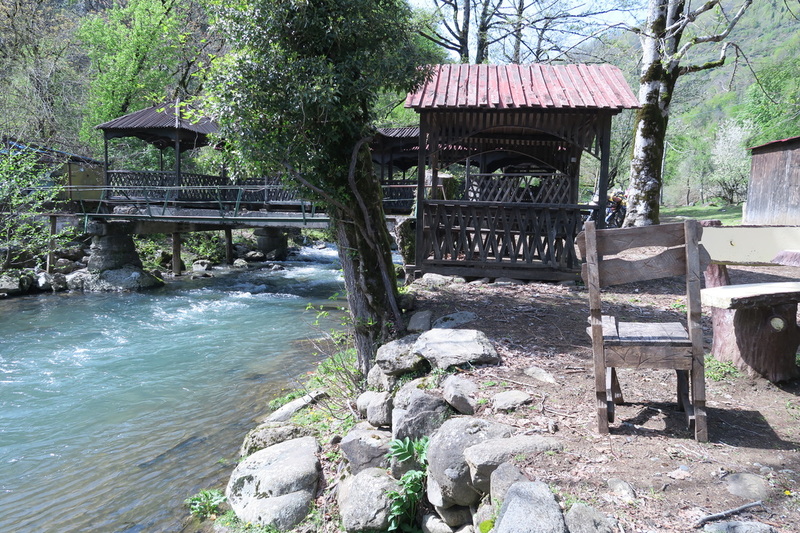 We crossed a bridge to a church at Rveli and sat at a picnic table under a tree and shared all our food. He had a coke bottle full of local made wine someone had given him . He was speaking to a man my age who in Russian was telling him thingswere better here under the soviet reign. Alex had to stop the conversation as he was settling in for the long haul about all todays problems. We decided to camp the night together at the Bojormi Nature reserve and headed into town to buy some more wine and make a night of it. 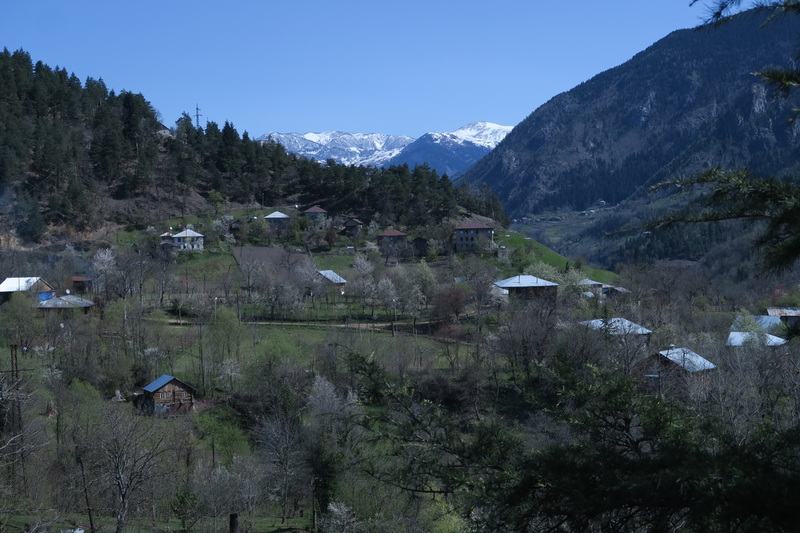 We had hoped to swim in the thermal baths but they were to far down a valley for us. We did not want leave our bikes. So we asked a farmer if we could get ome water forthe night. 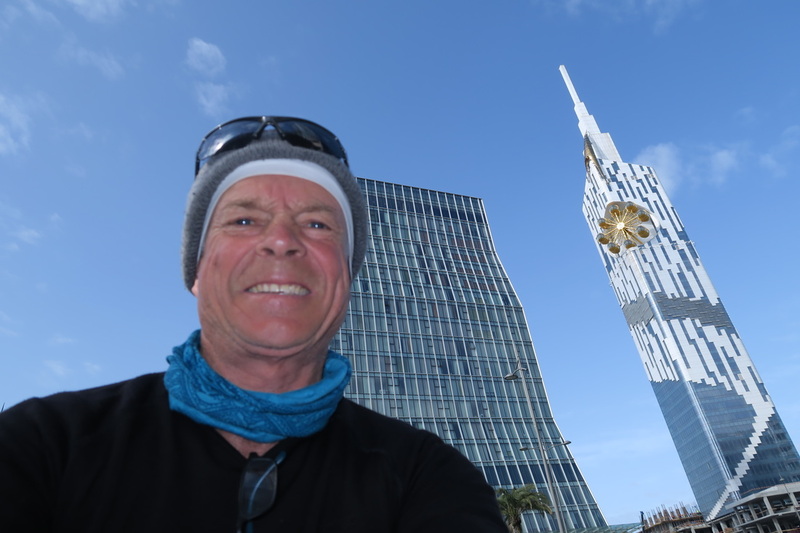 We had ridden a steep rod up from Bojormi past another ferris wheelin an odd place like the one on the building in Batumi. A brilliant camp in amongst conifer trees was found, what’s more the ground was covered in a soft moss. I fried up some potatoes and we had more cheese and meat. This was enjoyed with two bottles of remarkably good white wine. We were both a little laid back at the end of the evening. It was a great mild morning under the cover of the trees. We had the usual breakfast. Whilst packing up Alexs sleeping bag that he had placed in it compression bag decided to roll off down the hill and over the cliff down to whatever was below. He chased it but had no chance of catching the runaway. We packed up and both rode the 7km into the valley below. He was lucky in that there was a farm between the cliff and the river . He later texted me to say he had found it. I had to keep going. 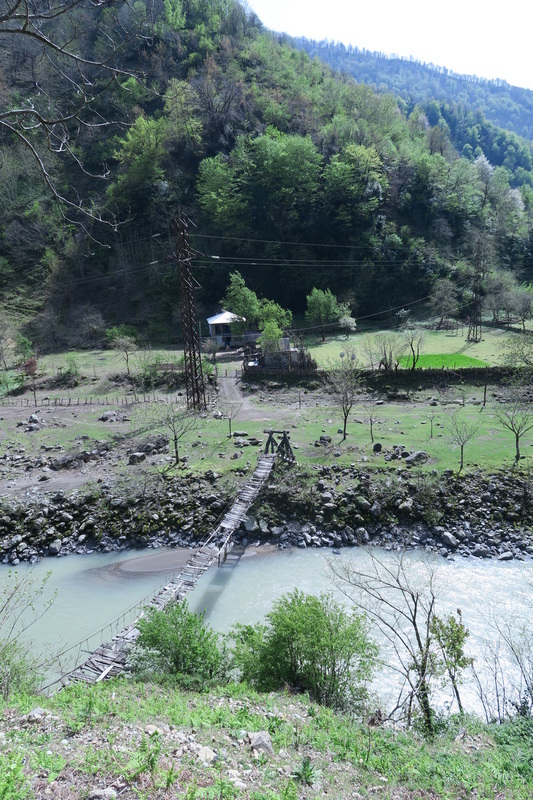 The road onto Gori followed the river again and was by most standards easy riding. 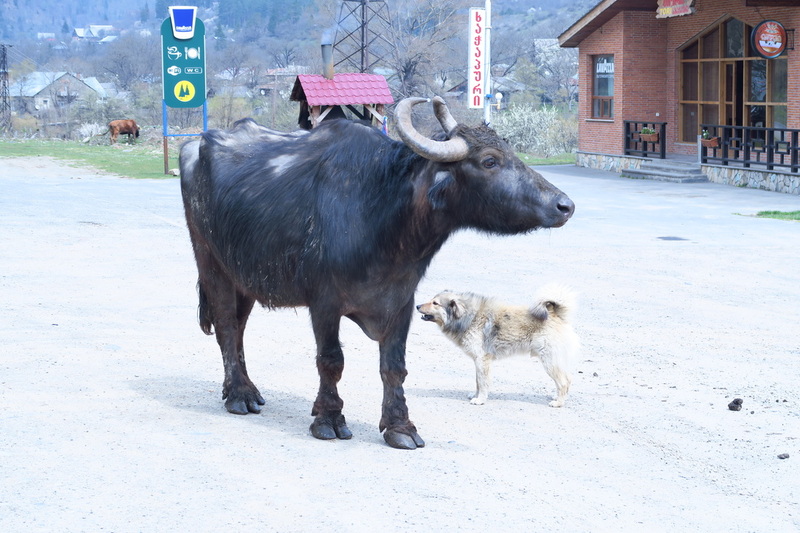 I stopped for ostri in a cafe and was standing ouside when two French cyclists rode past. They stopped and we talked for an hour. 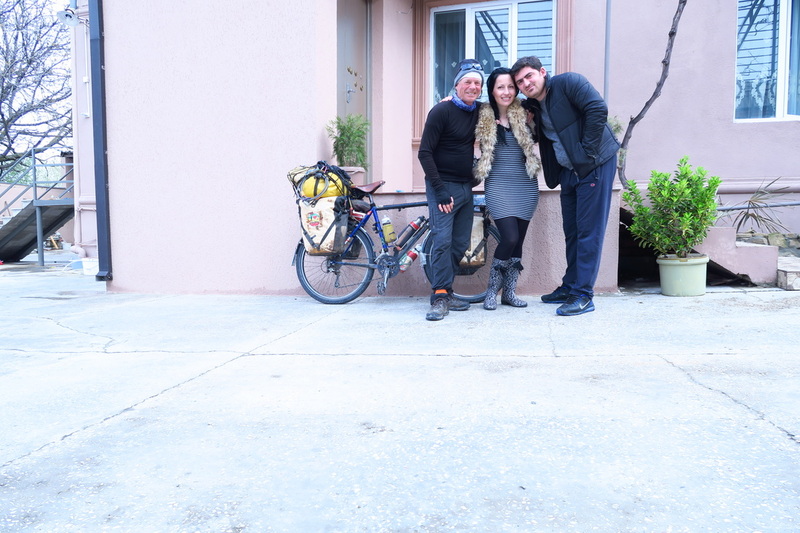 They were about my age and had ridden from France and were on their way to Iran as well. I was feeling a little bit jaded due to the wine last night. There was also a steady head wind blowing. 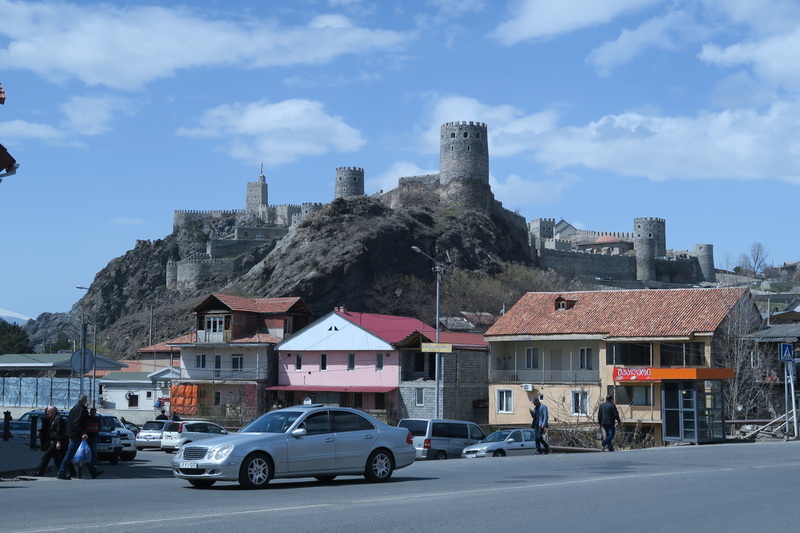 A stop was made in Kashuri where this road intersects with the main road to Tbilisi. The road now was busy and without a shoulder, though for the most part trffic was tolerant. Georgians have a habit of giving long blasts on their horns if you wave to them they will generally give one of these extended somewhat warning blasts back. Not just a gentle toot to say hi. After some kilometres thankfully the road merged with a great new concrete dual carriage way. The wind increased . 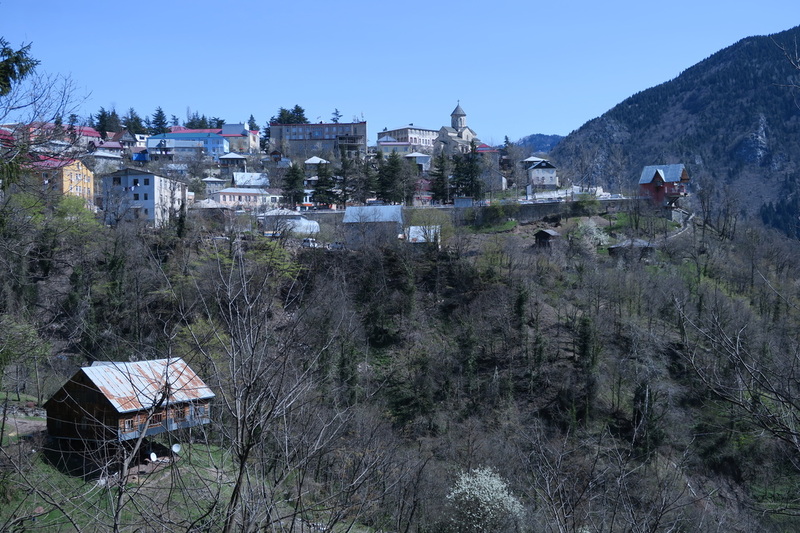 Alex had given me the address of a place in Gori to stay at so there was no need to hunt around when I arrived there . 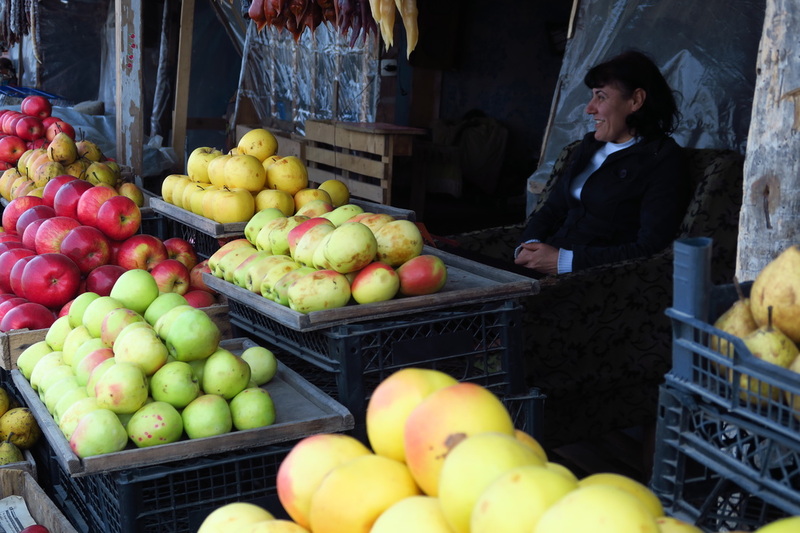 A stop was made at fruit stall some 10km from Gori, here some laughs were had with the owners of the stall. They gave me some fruit which was very kind. I almost forget where I am half the time. My memory was jogged when two Russian registered trucks pulled up. Arriving in Gori, the town famous as Stalins birthplace. A stop was made at a modern supermarket. Here coffee and cake was enjoyed. I found my way to Alenas guest house. The young couple Alona and Bake greeted me and showed me to a fantastic apartment on the ground level at the rear of their home. For me it wasa palace. A big double bed, kitchen,TV and separate shower. My legs were painful at the joints. It had been a hard push all day. I just lay on the lounge and did nothing for an hour,. Then had a shower. Then and there I decided to stay another day. This was one of the most comfortable places ever stayed in. The next morning Alona had me in for a huge traditional breakfast. 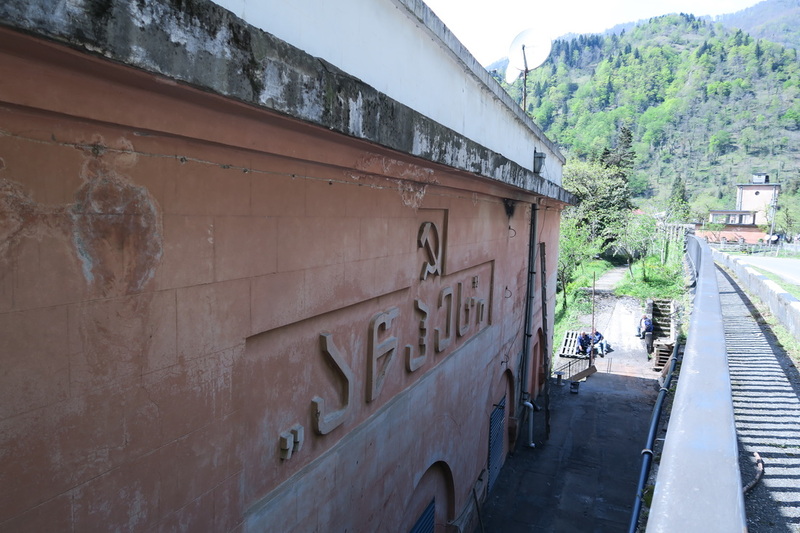 A visit was made to the Stalin museum and Bake took me to a guy to help with my wheel problem. He did not have the right gear. The noise is now where I need to put music on so I cant hear it. The two days here was just what I needed. There was a washing machine and good water heating in the room, so almost all my gear was washed. Though all my woollen things are washed by hand. Importantly it could all be dried before leaving. The second day was raining, the decision to stay was a good one. Bake took me to the supermarket and here two huge pork chops were bought. These were cooked along with some homemade applesauce. The Georgians don’t seem to eat it with their pork. The show The Vikings got me hooked so some 10 episodes were enjoyed. I had arranged with Elona to have breakfast at 0800, just as well I slept in till 0730. 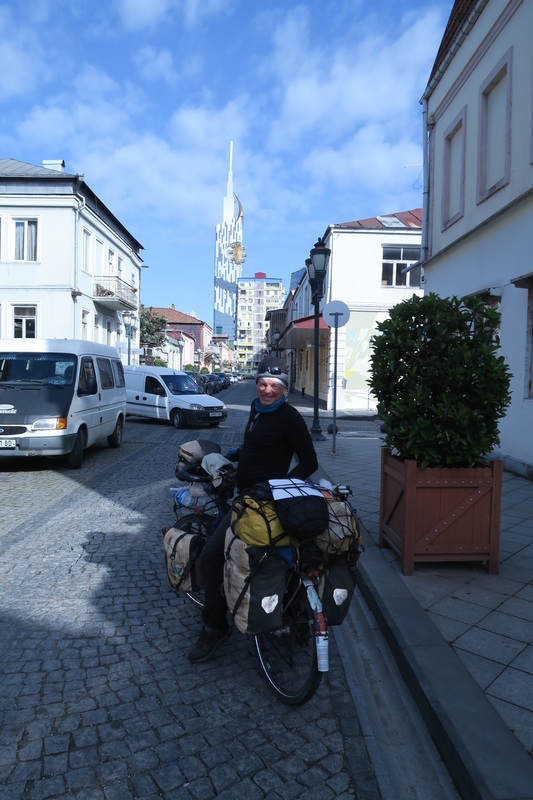 On Alexs advice the back road to Tbilisi was taken. Again, a great amount of food was enjoyed. The forecast to my good fortune was for a day without rain. On the way out of town, Bake caught me to give me a tube I had left there but said it was of no use to me. The road soon became very rural and relaxing. I love riding these rural roads. As water fountains were few and far between a bottle of water was bought. At 50c for 1.5 litres it is extremely good value. 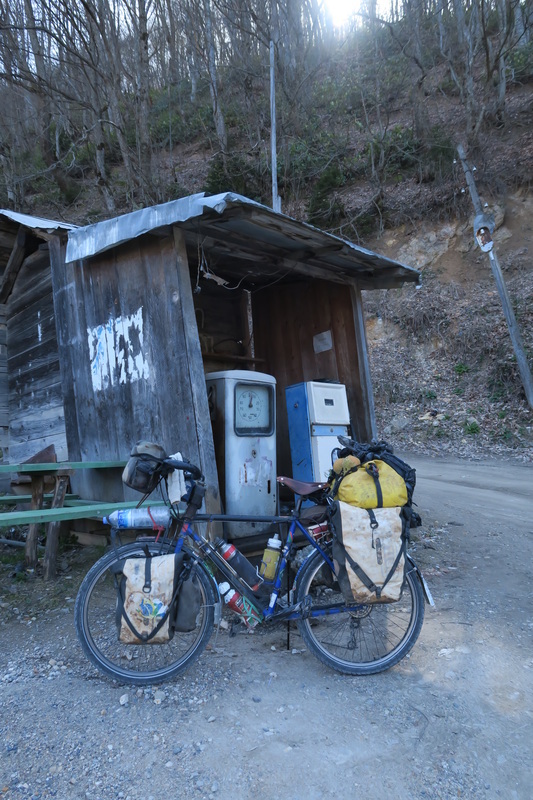 There was an on and off climb for the first 30km, then a slow descent through more villages until I intersected with the main highway into Tbilisi. 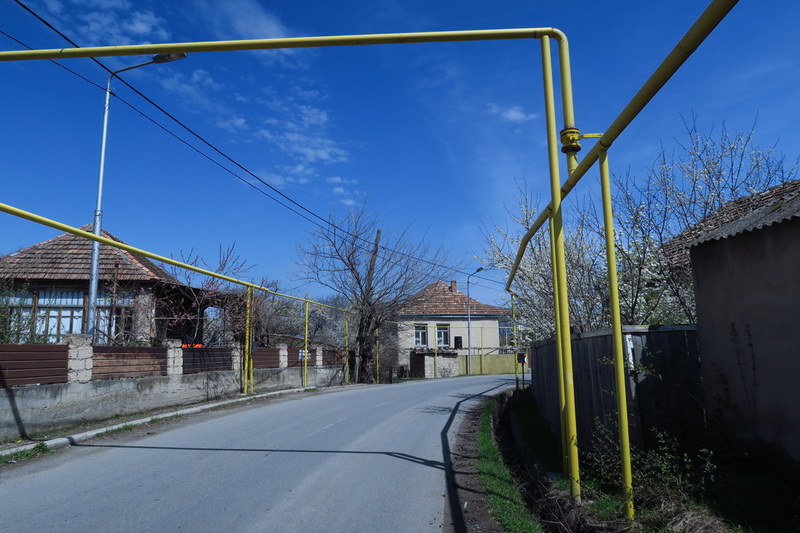 Many of the small villages had overhead yellow pipes on props running along the sides of the streets. They are gas lines. They are everywhere. An eyesore but so important to life here. Especially for cooking and more so heating. Gas has been a part of life here since the soviet days. 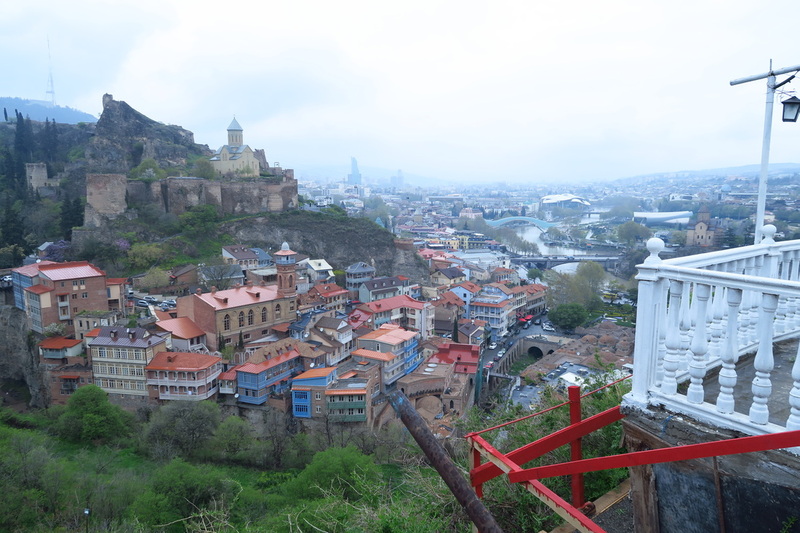 It was quite emotional arriving in Tbilisi, a city only dreamed about in the past. There is always a great bunch of emotions experienced when arriving in significant cities without the use of public or private powered transport. 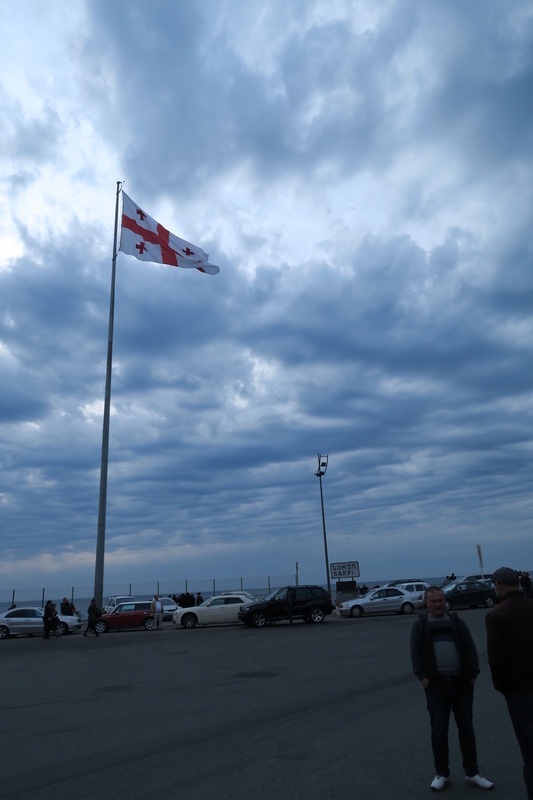 Tbilisi was no different. I went to a bike shop that I had seen on the interenet. They had no deore XT hubs. 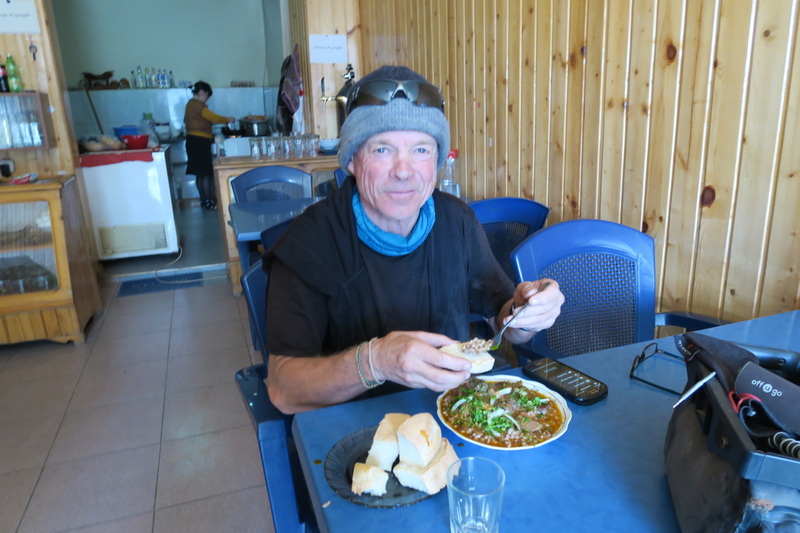 I then phoned Lado who I had arranged to stay with. He is a Warmshowers host. On arrival at his shop, he did have a deore 36 hole hub. This would have to do. I did really not want to fly back to turkey to get one. The flights were cheap and only 2.5 hrs but just all the waiting in airports spoils everything . Whilst here in Tbilisi I had to get my visa for Azerbaijan. Lado gave me directions to their embassy, which is in the old part of town. A taxi fare there was 10 lari. Azerbaijan is kind of out of my way. The decision has been made to go there on the train or catch a ride in a taxi from the border. I am really keen to have a look at the Caspian Sea and spend 2 or three days in the oil rich city of Baku. Lados mechanic, Dima stripped down my rear hub. It was found the bearing cup on the drive side was scored. The ball bearings were all intact. They had some dismantled XT hubs here at the shop, so we managed to replace the inner axle, both bearing cups on this and new ball bearings. This for me is great as it saves a trip back to Istanbul. So fingers crossed all is well until at least Tehran. t cities without the use of public or private powered transport. 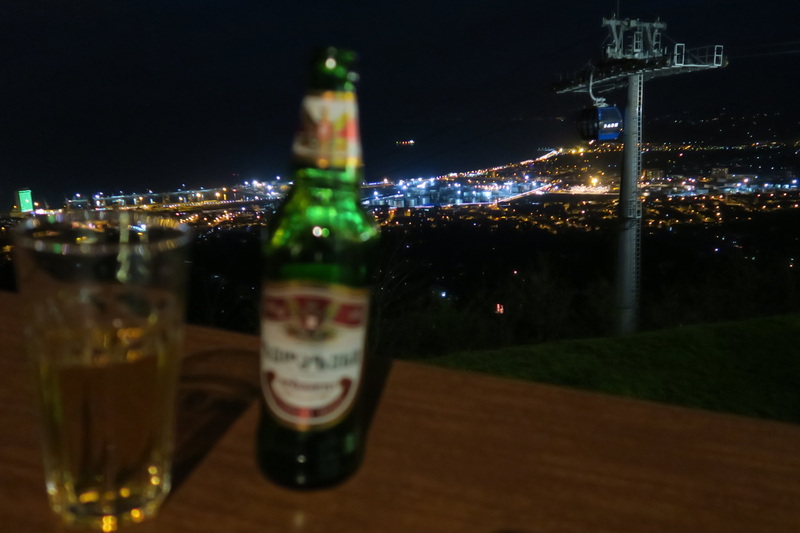 Tbilisi was no different. The guys from Doctors without frontiers who told me about Abastumani hot pools !! Queen of the markets in her big throne!! 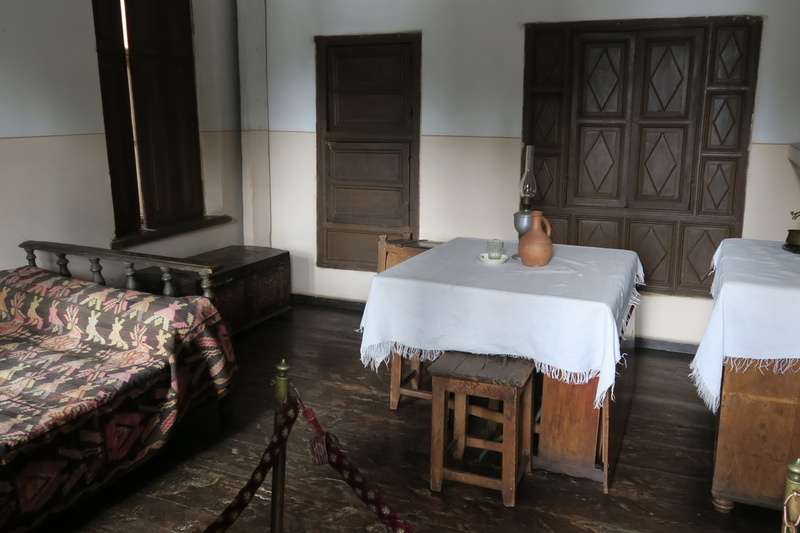 Stalin lived here in this little one room home in Gori with his parents for 4 years, both his other 2 siblings died. Bojormi Nature reserve, such a peaceful place and the best camping. 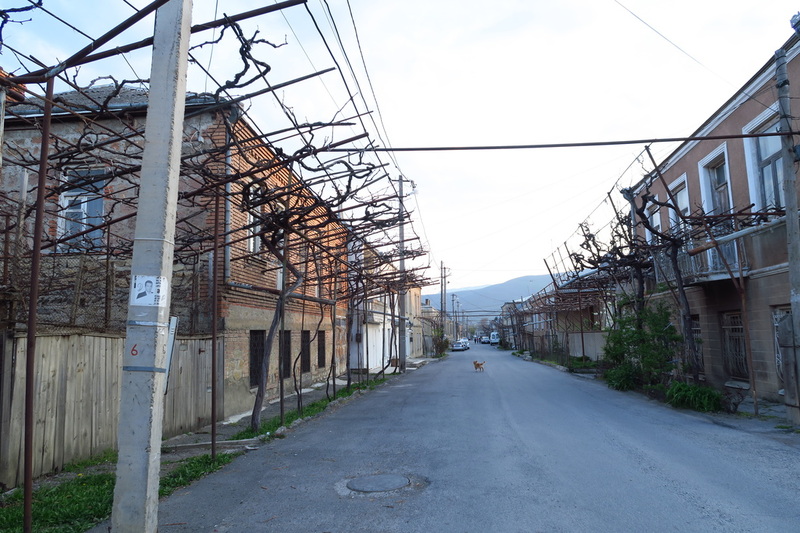 gas pipes line many of the streets in the small villages. Unsightly but such an important part of life here. 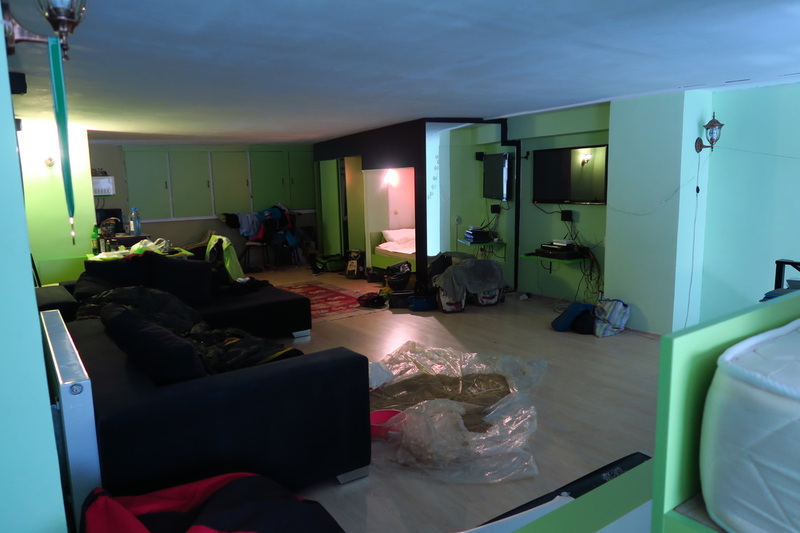 My warmshowers accommodation above Lados bikeshop, Velo+ ph2477790, 30, T.AbuladzeStr. 11A Aglaladze Str. WWW.veloplus.ge. A great guy with Dima , a great mechanic.